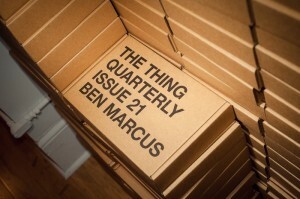 The Thing Quarterly is a periodical in the form of an object. It’s like a magazine, except that each issue is conceived of by a different contributor and then published on a useful object. Issue 21 includes a custom tin of Thompson Cream – a salve for people and things, as well as an accompanying booklet containing text by Marcus. It can be applied to most any situation. 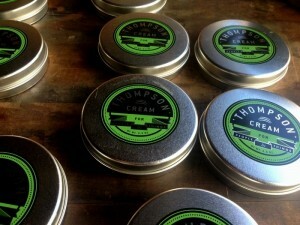 Our Thompson Cream was handmade with the help of Metaphor Organic, an SF-based purveyor of fine soaps and salves. It was mixed and poured in Co-Editor Will Rogan’s backyard in Albany, California. It contains all natural ingredients including sunflower oil and beeswax, and a selection of herbs and supplements including bacopa monnieri, gingko biloba, gotu kola, Spanish sage, 5-HTP, and coenzyme Q10. Net weight is 2.5 ounces of salvey goodness.